1. Cerebral circulatory disorders: a. Prophylaxis and maintenance therapy for symptoms of cerebral vascular spasms and arteriosclerosis. b. Sequelae of cerebral and cranial trauma. c. Postapoplectic disorders d. Migraine 2. Peripheral circulatory disorders: Prophylaxis and maintenance therapy for symptoms of vascular spasms and arteriosclerosis (obliterating arteritis, thromboangiitis, Raynaud's disease, diabetes, acrocyanosis pernio, etc.) such as intermittent claudication, trophic disturbances, pregangrene, trophic and varicose ulcers, paresthesia, nocturnal cramps, cold extremities. 3. Disorders of balance. Cinaron® 15 to 30 mg three times daily. 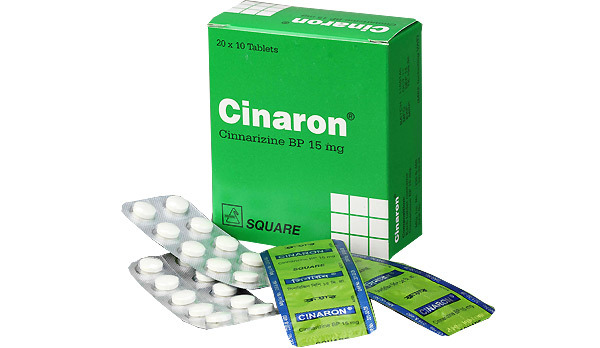 Cinaron® tablet : Box containing 20 x 10 tablets in blister pack.